.... rock crystal is also said to enhance energy, aid in healing, medidation & provide protection. Called the 'Universal Crystal' because of it's many uses, rock crystal has more myths & legends surrounding it than any other stone on the planet. One of these myths suggests that its clarity comes from water frozen inside it. 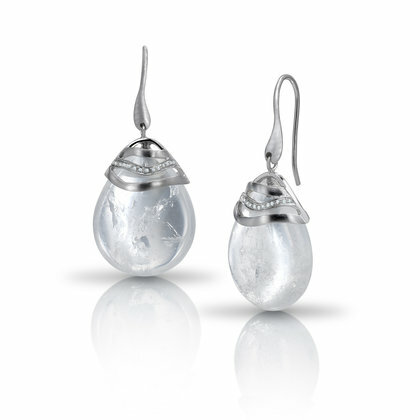 That thought captured my imagination and hence these rock crystal teardrops have been bespoke cut especially to capture their beautiful, icicle-like shards. Since no two pieces are completely alike, this makes them slightly different from each other, and unique to you. Whether you wear them with a little black dress or a simple white blouse, they'll make a real statement of style.